The exchange's turnover rally was short-lived, reverting back to a recent downtrend that has refused to abate. Deutsche Börse Group, a German institutional trading network, has reported its monthly order book turnover across all asset classes for July 2016, which has plunged MoM, paring last month’s gains, according to a Deutsche Börse statement. The group has seen a large spike in its trading volumes during June 2016 with turnover figures soaring as a result of Brexit-induced volatility. The trend proved to be short-lived however, as the latest figures came in at just $112.5 billion (€100.8 billion) across all its cash markets, corresponding to a fall of -23.3% MoM from $150.6 billion (€134.9 billion) in June 2016. The latest figures show a reversion to an ongoing downtrend at the venue, which has been pointed lower for the majority of 2016 thus far. 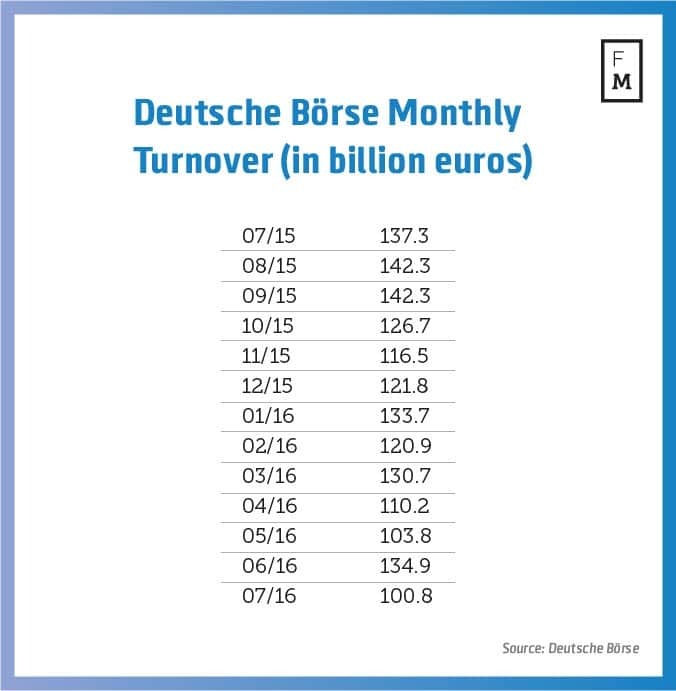 In looking at some of the other monthly statistics, July 2016’s latest turnover figures at Deutsche Börse were also much lower when weighed against their 2015 counterpart, as volumes notched a decline of -26.6% YoY from July 2015 after reporting $153.3 billion (€137.3 billion). Of the $112.5 billion in all, $102.5 billion (€91.8 billion) was attributable to Xetra, retreating -25.9% MoM from $138.3 billion (€123.9 billion) in June 2016. Taken over a yearly timetable however, Xetra’s July 2016’s turnover also incurred a tumble of -17.9% YoY from $142.2 billion (€127.4 billion) in July 2015. Moreover, the average daily turnover on Xetra also came in at just $4.9 billion (€4.4 billion) in July 2016, vs. $6.3 billion (€5.6 billion) in June 2016, or -21.4% MoM, as well as suffering a -20.0% plunge YoY from $6.1 billion (€5.5 billion) in July 2015. Finally, a turnover of $3.8 billion (€3.4 billion) was attributed to Börse Frankfurt in July 2016, approximately -19.0% lower MoM from $4.7 billion (€4.2 billion) in June 2016. Order book turnover on the Tradegate Exchange totaled an estimated $6.1 billion (€5.5 billion) in July 2016, dwindling -19.1% MoM against $7.6 billion (€6.8 billion) in April 2016.